Remember that proper kitten care also requires an examination from a cat friendly veterinarian, kitten vaccinations, deworming and other forms of care that support development throughout the various phases of kittenhood. Under 4 Weeks of Age: Kittens are considered newborn kittens from 0-4 weeks of age. During this time, newborn kittens are just developing motor skills and coordination. They are also learning how to regulate body temperature. At this time in their life, they count on their mother for warmth. If the mother cat is still with the kittens, there is very little required for human caretakers besides a warm safe environment, good nutrition and veterinary care for the mother cat. If for some reason the mother cat is not able to care for the kittens, then a fair amount of care is required to help the kittens grow and thrive. You should plan an immediate visit to see us with the kittens so we can review their needs especially relating to feeding and monitoring their progress. This includes bottle feeding kittens every 2-4 hours, keeping their environment warm and safe and helping the kitten to urinate and defecate. Be sure to keep them warm with blankets, especially if they have been separated from their mother and/or siblings. You can definitely hold the kitten during this time, but please be extra gentle, as their bones are still forming. 5-11 Weeks of Age: By this time, newborn kittens should be weaned off of their mothers or bottle-feeding, and feeding on a high protein, energy dense diet. During this stage, their motor skills and coordination should also be progressing. Beware that when this happens, your kitten will become quite the force to be reckoned with! How to take care of a kitten at this age includes proper supervision in order to ensure that your kitten's newfound sense of adventure and bravado doesn't lead them into dangerous situations. 4-6 Months of Age: Your kitten is reaching an age of adolescence and therefore, sexual maturity. This will result in an increase of energy and at times, behavioral changes similar to an adolescent human child entering puberty. How to take care of a kitten during this phase includes continuing hands-on bonding-based playtime with the addition of behavior modification if necessary. There are many ways to enrich your cat's environment, which is especially important for indoor kittens. During your next appointment we should discuss ways to build an enriched environment that provides the right amount of stimulation your kitten instinctively desires. At approximately six months is the time to plan for your kitten to be spayed or neutered. Most kittens will go through puberty at approximately 6-8 months and it is recommended that they are spayed or neutered just before then to avoid unwanted kittens. By 5-8 weeks of age, your kitten should be able to chew its own food, and you should provide a protein rich and energy filled diet, with feedings taking place 3-4 times daily. There are many different types of kitten food available, and we would like to discuss these dietary options with you at your next veterinary appointment. Typically, we recommend canned food because it will mimic the natural diet both in consistency and formulation. However, a good diet may also consist of a combination of canned and dry cat foods. As you can see, kitten development is filled with fun, but requires you to be actively involved in the process. It is critically important that you consider the time commitment necessary to do your part and ensure proper kitten development. 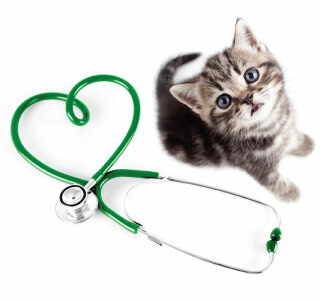 Schedule A Kitten Care Appointment With Southern California Veterinary Group of the Inland Empire Today! While caring for a kitten can certainly be one of the most fun and rewarding experiences you can have as a pet owner, if you are under-informed about the needs of your kitten during this time, you can leave them at a developmental disadvantage. At Southern California Veterinary Group of the Inland Empire kitten care is one of our greatest joys. Our veterinary staff would be delighted to spend some time with you and your kitten ensuring that your relationship will be a healthy, happy and rewarding one for many years to come. Schedule your first kitten care appointment today!